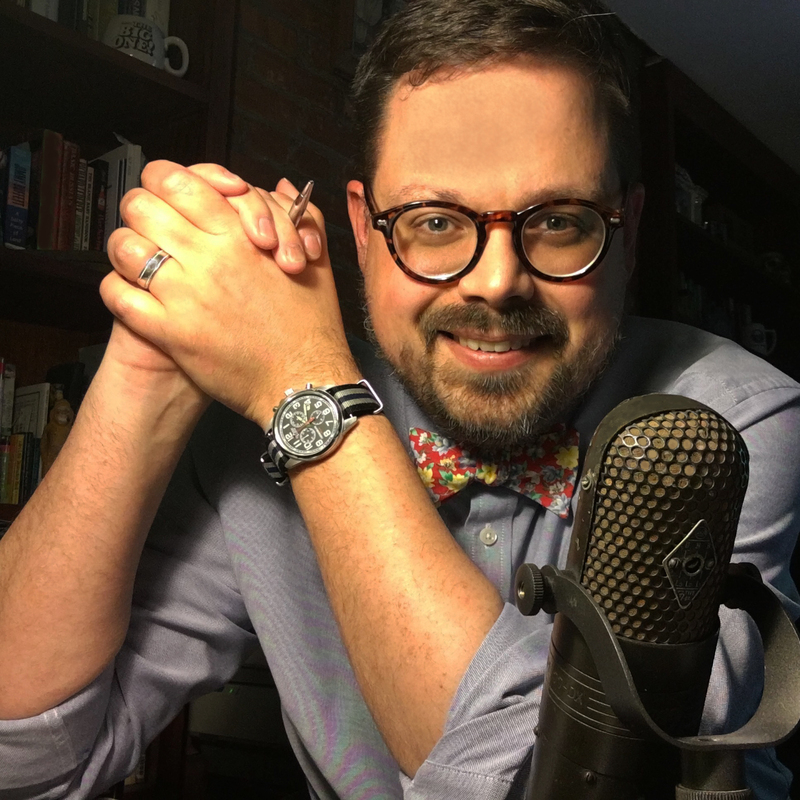 The City of Buffalo owned Memorial Auditorium and ran the day-to-day operation of the venue in a way that doesn’t happen with Erie County and First Niagara Center. This included apparently, changing the oil on the Zamboni. 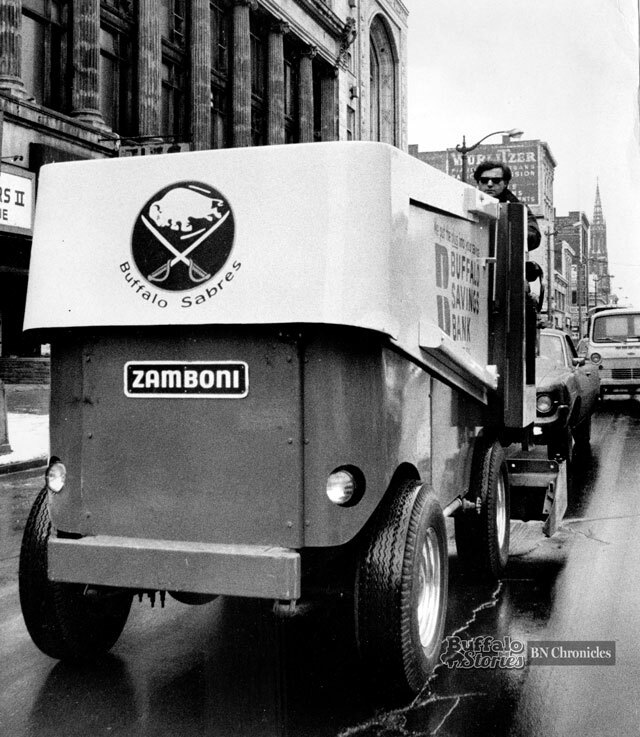 Whatever exactly that meant, it involved driving the Zamboni from Memorial Auditorium up Main Street to a city garage for repairs. The maximum speed for this vehicle — which is cruising the 600 block of Main in these photos — was 8 mph. Likely the heads of a few lunch patrons at the Swiss Chalet’s original location (across Main from Shea’s) were turned, as The Aud’s ice resurfacer incongruously schlepped its way past the window. The repairs must have worked. 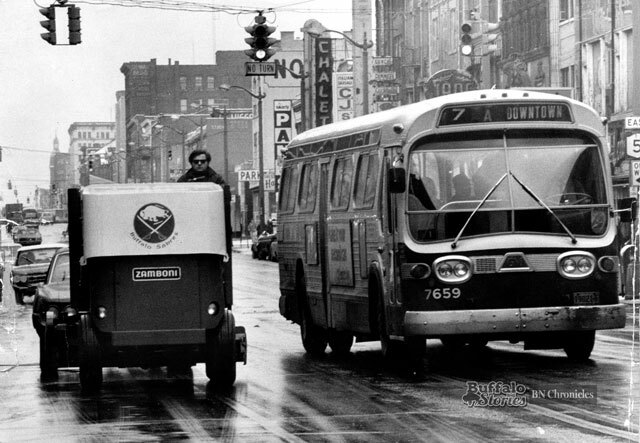 The ice was so great at The Aud the following night that the Sabres and Flyers combined for 12 goals in a 6-6 tie. 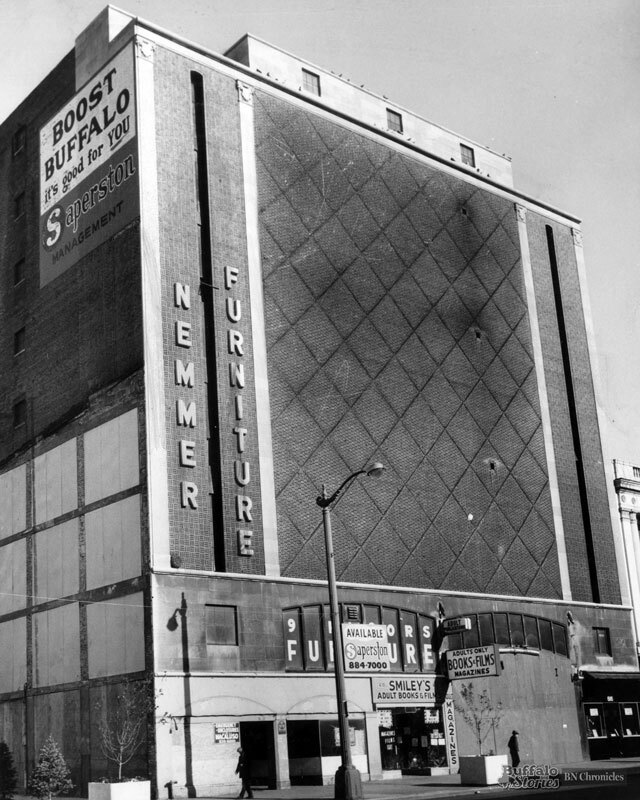 Nemmer Furniture began selling the upholstered items it manufactured at its Genesee Street factory in 1924, but didn’t move its showroom to the 600 block of Main Street until 1957. Before that, the building was the home to Select Furniture. After Nemmer closed in the early ’70s, the building sat mostly vacant until the late ’80s when plans emerged for the addition of several floors and it the new condo development was dubbed “City Centre.” Work began in 1991, but ground to a halt in 1995 when the project wound up in bankruptcy. After a decade of stops and starts, by the early 2000s, City Centre was acknowledged as Buffalo’s first successful downtown condominium project.